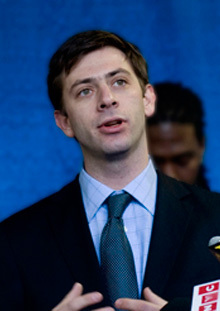 Council Member Stephen Levin grew up just outside of New York City, in Plainfield, New Jersey. He knew he wanted to be in Brooklyn even while he was attending Brown University in Providence, Rhode Island. To get there though, he dabbled with various jobs including working as a waiter (he was fired), a book store clerk, and an artist’s assistant. About a year after graduation from Brown, he was living in Bushwick, Brooklyn and starting his political career, although maybe he didn’t quite know it at the time. He got his first advocacy experience at the Lead Safe House Program in Brooklyn, which gets children with elevated lead levels out of danger and into a safe space. Levin ran the program and worked with families and building owners from across the borough, as well as State and City agencies. He also helped families tackle various other issues, such as education and health, during their stay at the Lead Safe House. Seeing families through a sometimes difficult bureaucratic process, he couldn’t help but make the connection between government policy and effective direct service. It was here that he first thought that if the opportunity to actually conceive and implement good policies presented itself, he would take it. Opportunity knocks. After working in the neighborhood for some time, Assembly Member Vito Lopez noticed Levin’s community advocacy abilities and hired Levin as his new Chief of Staff in 2006. Levin learned how to build coalitions and organize the community into a politically empowered force, particularly on housing issues. So in 2009, when City Council District 33 had an open seat despite a crowded democratic primary field to fill it, he thought “Why not? What’s the worst that could happen?” He knew the community from working in Lopez’s office but he also realized that an effective City Council candidate has to knock on a few thousand doors to uncover the issues that matter most to voters. That strategy paid off; Levin was elected with 33.9 percent in the primary election and easily won the general election. Levin called it a valuable experience that he’s looking forward to doing again this election year. Housing now, not later. Levin represents some of the most coveted, as well as gentrified, neighborhoods in Brooklyn. He is always looking for ways to balance affordability with desirability, either by advocating for rent and vacancy controls on existing housing stock or demanding increased affordability from new developments in his district. When Levin first became Council Member, he fought for, and accomplished, a 10 percent increase in permanently affordable units and more family-friendly, three- and four-bedroom units in the Rose Plaza on the River development proposal. He was excited to hear Speaker Quinn focus on affordable housing in her recent State of the City Address and believes that the best way to meet the City’s housing needs is to fund it now. Additionally, Levin is deeply concerned that the City is falling dangerously short on senior citizens’ housing needs. He is troubled that whenever he meets with seniors, someone will invariably tell him that they are facing eviction. The City is not building any new senior housing because of federal budget cuts, but the need for senior housing increases every day. Senior housing is one of the toughest issues he is working on and he constantly seeks plausible, good ideas from the administration on how to address the problem. How do you spend a million dollars? Last year, Levin joined seven other Council Members in giving the community a voice in how to spend $1 million in taxpayer money. Launched in New York City in 2011, the Participatory Budgeting program seeks to democratize the budget process. Council Members agree to set aside a portion of their discretionary budget and let the community decide how to spend it. District residents propose and vote on capital projects during a series of public meetings. Council Members submit the projects with the most votes as part of their funding priorities in the City Council’s budget. Levin wants his constituents to feel that local government is responsive to the community’s needs and believes Participatory Budgeting encourages trust by promoting budget transparency. Some of the community’s proposals for District 33 include a pedestrian-friendly connection to Brooklyn Bridge Park via Atlantic Avenue, improvements to the Taylor-Wythe Houses playground in Williamsburg, and renovations to the P.S. 261 library in Boerum Hill. Final votes on the projects are expected to be held this April. A good ending makes a good beginning. Levin’s end of term goals include getting Mayor Bloomberg’s administration to follow through on his open space commitments on the Brooklyn waterfront, such as at 65 Commercial Street. He also wants education to be a focus of his reelection campaign, especially early childhood education. Levin sponsored resolutions to call on New York State to require that all 5-year-old children in New York City attend kindergarten and to support breakfast in the classroom initiatives. He said that education is a very basic, fundamental responsibility of the City because nothing is as important as the education of children. Even if Levin runs unopposed this fall, you can be sure he’ll be knocking on doors just as he did four years ago, generating ideas for an even better second term. Stephen Levin is Chair of the Planning, Dispositions & Concessions Subcommittee. CityLand has also profiled Leroy Comrie, Land Use Committee Chair; Brad Lander, Landmarks, Public Siting & Maritime Uses Subcommittee Chair; and Mark Weprin, Zoning & Franchises Subcommittee Chair.